Officer Kevin St. Peter brings 27 years of policing experience withhim to his new post as resource officer in the Caribou school system. CARIBOU, Maine — Officer Kevin St. Peter brings 27 years of policing experience withhim to his new post as resource officer in the Caribou school system. St. Peter, a veteran of the Caribou Police Department, greeted students and staff on Monday as they came to school on his first day in the new position. He then worked with high school staffers to equip his office, located in the main lobby, with a computer, phone, and a large flat screen TV that will broadcast live camera footage of the school. He spent the previous week attending a 40 hour class in Augusta training to work in schools, and said his primary motivation for applying was the opportunity to interact with students and make a positive impact. Over the years, St. Peter has given numerous presentations in local schools, teaching younger students about the dangers of drugs and giving internet safety instruction to middle schoolers and high school students. St. Peter’s duties within the school system are mostly similar to his work with the Caribou PD, with the key difference being that he now has an opportunity to make connections with students, and to ideally play an active role in preventing crime before it occurs. Reactions to the new resource officer have, on the whole, been positive so far. Like any other police officer, St. Peter is equipped with a gun and handheld radio. He also is legally able to search school property as long as he is acting in conjunction with school administrators. 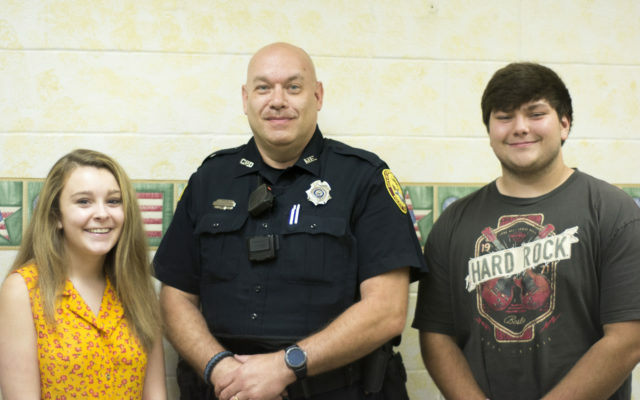 CHS Seniors Wyatt Taggett and Emily Michaud said they believe the addition of the resource officer will be beneficial to the school. Taggett said he heard about the officer last week while Michaud said she heard about it at the end of the last school year. “I heard they were going to start doing this, especially now with the new super school coming in,” she said, referring to the pre-kindergarten to eighth grade complex that officials broke ground on earlier this month. They said that other students seem to be optimistic about the officer as well. CHS Principal Travis Barnes said he is looking forward to seeing positive results as St. Peter becomes acclimated to the new position. The principal added that Maine has been statistically very fortunate to not have had a school shooting or violent incident, but that the prevalence of these events in national news can distract students from their education, which should be their top priority. “Education is taking a second seat if students are worried,” he said. “Having Kevin here helps with that, and obviously there are other ways that we’ll utilize his services,” adding that St. Peter also will serve as a counselor to students. Reed Nonken, a teacher at both Caribou High School and the University of Maine at Presque Isle, has years of experience as a police officer and still serves in Limestone when the department is “in a pinch,” he said. Nonken said he hopes to see students obtain an educational benefit from St. Peter’s presence, as he could assist with safety-related training, He also hopes for benefits in terms of community relations. He added that the counseling aspect of St. Peter’s position could potentially lead to the prevention of a crime or dangerous incident before it occurs. Just two hours into his first day, St. Peter said he was looking forward to his future at Caribou schools.